The fingers are being pointed to single out people for mockery. But she also saw it as a way of shifting responsibility. I think she is right. The pointing finger is the finger that assigns responsibility. When it points to mock, it is designating the scapegoat. If the scapegoat is not explicitly given the blame, then the role of the scapegoat is to validate the existence of the inner circle by creating someone who is not part of the inner circle. And in an inner circle, by nature, questions of responsibility do not arise. One is not judged on merit but on membership. The great and spacious building is key to understanding the modern structure (the Cathedral, That Hideous Strength, the Clerisy, the New Class, the Polygon, etc.). It explains its relationship to status. It highlights its divorce from reality, its existence in a purely social and symbolic world. Understanding that the modern structure is a way of shifting blame and avoiding responsibility is also a valuable insight. It explains the victim sweepstakes and the grievance mongering. (A spiritually degenerative pursuit, obviously). The blame-shifting aspect is what caught my attention. Today’s pointing fingers manifest themselves as mockery, belittling, snarkiness, sarcasm, rudeness, etc. There is so much viciousness in this world, particularly the online world, where a feeling of detachment and anonymity fuels a culture of disrespect. Rather than fine apparel, people adorn themselves with finely-crafted snark intended to crucify some soul in the hopes of impressing… who exactly and why exactly? When you point the finger of scorn, you’re right there with them, and this is no light matter; the great and spacious building is the church of the Devil (2 Nephi 28:18). If you find that you are elevating at the expense of another, then there you are. Remember that this building represented the “pride of the world” (1 Nephi 11:36) which means that as soon as all of us stop making comparisons and trying to put ourselves above one another, the building comes crashing down (1 Nephi 11:36, 2 Nephi 28:18). There are so many places in the scriptures that emphasize the principle of us esteeming each other equals, as one. Blame-shifting, although a good point, is not an explicit element of the vision, where fingers point only to scoff. The subsequently ashamed had faithfully pressed forward until they partook of the fruit but apparently weren’t ready to receive it. Did they merely go through the motions to get there? Perhaps their soil was unprepared, their foundation sandy, or they perceived the sweetest of fruit as bitter. Whatever the reason, they couldn’t take the heat, succumbed to peer pressure, and exited stage left. Enduring well throughout the path toward exaltation shows that you have chosen sides, the Lord’s side, from which there is no turning back, that is, without dire consequences. Are the occupants of the great-and-spacious blaming those at the tree for their, the occupants’, tenancy there? Pride could, of course, provoke this attempted shift of responsibility. One antidote to pride is indeed treating everyone as an equal. And equality closely couples with humility. The humble respect others’ opinions, are open to new ideas, civilly maintain disagreement. The humble do not react, which often results in a subcontracting of the fallacy factory (its best seller being ad hominem). I agree that it isn’t an explicit element of the vision, it’s just another facet of consideration. The lack of specificity gives us the ability to liken the framework presented to many different aspects of our own lives. I wonder if you have pondered something similar, you’ve hinted at a few other parables as well. All that made it to the tree followed the same path and arrived at the same destination. It seems that desire played a role too. Where your treasure is, there will your heart be also. Could it be that they valued the words of the mocking crowd more than the prize they held in their hands? 1 Nephi 8:33 has another powerful point that goes along with your comments about humility and reaction. 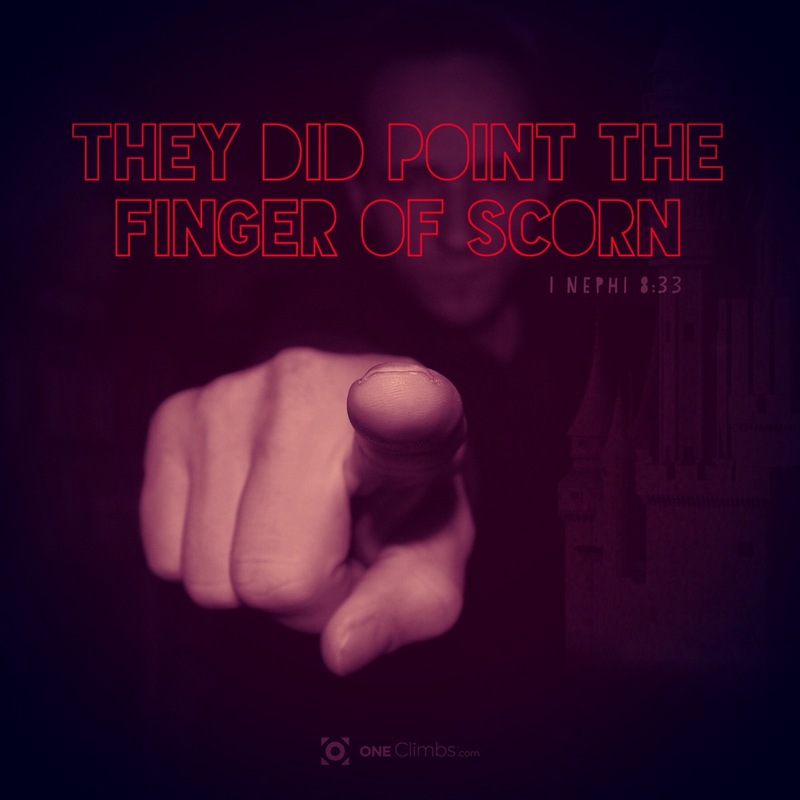 Note what Nephi said: “…they did point the finger of scorn at me and those that were partaking of the fruit also; but we heeded them not.” They simply gave them no heed. They didn’t give them the satisfaction of a response and that can sometimes be hard to do.